When a poker room is calculating your rakeback from the cash games you have played in, they will use one of 2 (well, technically 3) possible methods for working out how much rakeback you receive. There is also a less-common "shared" method, which is a variation on dealt rakeback calculations. Different rooms will use either one method or the other, although the contributed method for working out rakeback is the most popular at the moment. The most popular rooms that use the less-common dealt method are Full Tilt and Cake Poker. 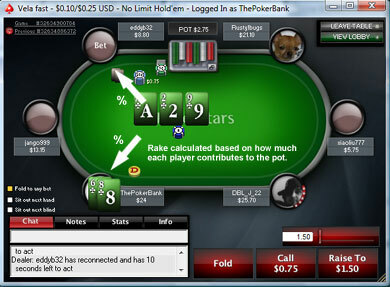 The contributed method calculates rakeback from the amount of money that you have put in to the pot. The more of your own money you put in to the pot, the more rakeback you get. The less of your own money you put in to the pot, the less rakeback you get. Easy stuff. Let's say you end up playing a $60 pot in a $100NL game with 3 other players at Aced, where you get 30% rakeback and the contributed method is used. If you had put $25 of your own money in to that $60 pot, your rakeback would be worked out from the rake generated from the $25 you put in to the pot. The other players' rake and rakeback will be worked out based on how much they had put in to the pot as well. Rooms using the contributed rakeback method. The dealt method calculates rakeback by sharing the total rake paid between all the players that had been dealt a hand at the table. You do not have to play a pot to get a share of the rakeback with this method, you just need to be dealt a hand. 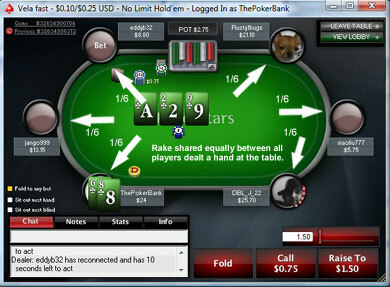 Therefore whereas with the contributed method the rakeback you generate is based on the amount of money you put in to the pot, with the dealt method the rf money you put in to the pot, with the dealt method the rakeback from the pot total is shared equally between all of the players at the table. Let's say you are sitting at a 6-max $100NL table at Full Tilt, where the rake is 27% and the dealt rakeback method is used. The final pot again reaches $60, but you folded preflop didn't put any of your own money in to the pot. Nonetheless, the rake and rakeback will be shared equally between all 6 players that had been dealt a hand before the flop. In this example it would not make a difference if we had put $30 or $0 in to the pot. As long as the final pot reached $60, the $3 rake and rakeback would be shared equally amongst all 6 players at the table. Rooms using the dealt rakeback method. The shared method is quite like the "dealt" method in that the rake is shared equally between players at the table. However, the difference is that to be included in the rake that's shared at the table you have to voluntarily put money in the pot. Therefore you will not generate any rake in the shared method by being dealt a hand and then folding like you would with the standard dealt method. Let's say you are sitting at a 6-max $100NL at a room where the rake is 30% and the shared rakeback method is used. The final pot again reaches $60 and you placed $15 of your own money in to the pot. 3 other players also put money in to the pot. The rakeback will be shared equally between you and the 3 other players. The other 2 players that did not enter the pot and folded their hand before the flop will not receive a share of rakeback from this hand. None that I know of today. This must have been an old method for calculating rake that is no longer used in favour of the more straightforward "dealt" method. Which type of rakeback is the best? Contributed rakeback is preferred by loose-aggressive players that play more hands than the other players at the table on average. Dealt/shared rakeback is preferred by tighter players that play less hands than the other players at the table on average. With contributed rakeback, if you're the type of player that plays lots of hands and generally builds bigger than average pots compared to the other players at the table you will receive more rakeback for your efforts. This is because you will be generating more rake than the other players would be generating for you with the shared method calculations. As a tighter player, you may find that you do not generate a lot of rake for yourself because you play fewer raked pots overall. Therefore you may find that you earn slightly more rakeback by sharing the rake that other players at the table generate through the dealt/shared rakeback methods. In all honesty though, the amount of rakeback you get from either of these methods will work out to be near-enough the same over the long run. I wouldn't choose one room over another simply because I preferred the contributed method to the dealt method or vice versa. Even if you are a very loose or tight player, the difference in the amount of rakeback you receive will be minimal (assuming the rakeback %'s are the same). It's nice to know the differences between the different types of rakeback, but I wouldn't let it influence my decision when it comes to choosing a rakeback room to play at. If you want to see some math behind contributed vs. shared, check out this 2+2 rakeback calculations thread.